Whenever we were in India we rarely visited the street stalls, as my over protective grandma thought we were prime targets for kidnapping. Looking back, she was really overwhelmed when we were there, which was quite frequently, and her overprotective barrier wouldn’t allow me to do half the things my native cousins did freely. I’d crave street food when I was in India. The house staff or driver would be marched off to collect a take-away version from the same street stall and I’d gobble it down like a portly pig and she’d sit there watching me and smiling. The struggle of finding high quality food in restaurants led to me learning more about Indian food. I come from a family of foodies so standards have never been compromised. My mum always says if you cook with love it always tastes delicious. I love food and cooking so my food is always twice as amazing. I prefer cooking at home and would rather have a lavish dinner party at home surrounded by family and friends than go to restaurants for dinner. You can recreate most things according to your taste at home and it’s always nicer having tailor-made bespoke things in life rather than something off the rack or menu. If you love a vegetarian pav bhaji you will most certainly love keema Pav, the meaty sibling of the vegetarian version: buttery, warm soft bread dipped in a spicy minced chicken masala. The bread absorbs the juices from the chicken masala as you scoop up the spicy chicken, topped with finely sliced red onions, a bite of a fresh green chilli and generous squeeze of fresh lime. Did I die and go to heaven or is this heaven on earth? This was exactly the same feeling I got when I first tried keema pav. A guilty pleasure which I enjoyed time after time on my visits to India. Being born in England and having lived in England all my life, it’s quite hard to adjust to the quantity of spices they add to food in India. Even so, this doesn’t stop me from the odd indulgence, creating a contemporary version without forgetting the foundation of these recipes. There are numerous flavours when eating keema pav bhaji: the spices, the heat from the chilli powder, the sourness of the lime, the earthy flavour of coriander, the freshness of the mint – to name a few. The freshly made pav (bread rolls) are soft and fluffy. They turn a beautiful golden brown colour when they’re dipped into the foaming butter and soak up the delicious juices of the keema. Sometimes I cook a sunny-side egg and dip the bread in the yolk to add more richness. 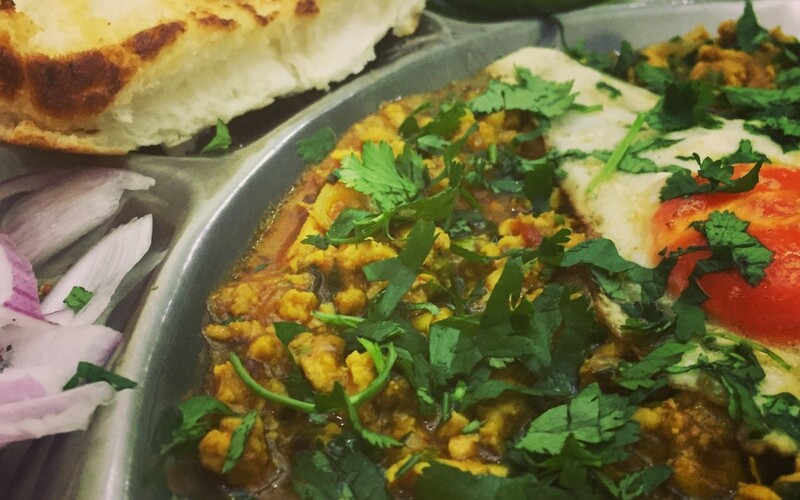 I have always indulged and the fried or poached egg on top just allows me to eat the keema pav bhaji for breakfast as well as lunch or dinner. This sounds so delish! only ever eaten the veg option. Thank you for any other informative site. Where else could I am getting that kind of info written in such an ideal method? I’ve a mission that I’m simply now operating on, and I’ve been on the glance out for such information. I am usually to running a blog and i really appreciate your content. The article has really peaks my interest. I’m going to bookmark your site and maintain checking for new information. Very nice! I have a need to try this. Thanks for sharing.